The compensatory picks awarded to teams can't be traded. Baltimore has enough of their own (as well as the 6th round pick acquired from the Boldin trade) to make some moves though. Might have worded that funny. By gained picks I meant the picks received in the trade back from our first round and the two sixth Rounders I meant was our own and the one from boldin. This trade scenario is also a little farfetched but more realistic than the three second Rounders. Watching his highlights on youtube, I see he has a history of giving Roethlisberger problems. This pleases me . Did a huge fist pump when I read the news this morning. do we know the actual numbers yet?? He’ll have a chance to go up against more RTs this season, who are typically not as good pass blockers as LTs. Last season Dumervil rushed 117 times from the offensive right side (ORS) which included 7 of his 12 sacks and 23 pressure events. He was, in fact, the NFL’s most productive pass rusher from that side among either 4-3 DEs or 3-4 OLBs with pressure on 20% of pass plays (Kruger 18%). I’d be surprised if the ability to move him opposite the RT wasn’t an important consideration to the Ravens. 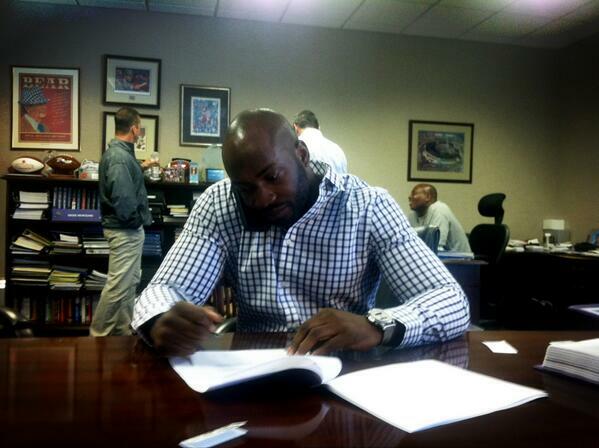 Dumervil will be wearing #58 with the Ravens. That might be my new favorite stat. Unleashing Dumervil against right tackles with Suggs across from him and Ngata in front of him will be a pleasure to watch. Sub-packages with Canty and McPhee on the defensive line and maybe even Upshaw blitzing up the middle could make things even more fun. That he's reuniting with Martindale and getting introduced to Ted Monachino, who worked wonders for both Suggs and Kruger, makes it all the more exciting. For that matter, I don't know if Pees has ever gotten a chance to run a defense with edge rushers of this quality. Closest he probably came was 2007 with Mike Vrabel and Adalius Thomas, but for the most part in NE he was relying on pressure from guys like Tully Banta Cain (who he was able to get a big year out of), Rosevelt Colvin, and Derrick Burgess. And last year he had Kruger but a hobbled Suggs. I could see him using a much tighter cushion on his receivers than we're used to with us being able to hopefully rely on a legitimate pass rush. Ravens pass rush goes from "meh" to arguably the NFL's best with a couple of under-the-radar free agent signings...who'da thunk it?! Anyone who trusts Ozzie would have. Ouch, good one. How's the view from your high horse? Just keep in mind he's probably not going to be going against the likes of Jeromey Clary, Derek Newton, Willie Smith and the like every week.